Large crowds turned out for the parade, including groups of protesters. THE CONSENSUS FROM O’Connell Bridge and elsewhere in the city was that the pope passed by rather quicker than anybody had been expecting. “That was a bit too fast, wasn’t it? You wouldn’t even have time to have a selfie,” one man, who insisted he had no particular interest in the pope but happened to be in town anyway, said. Sitting close to him on the wall of O’Connell Bridge, a couple who had travelled from the North for the weekend’s events agreed he had gone by faster than expected. 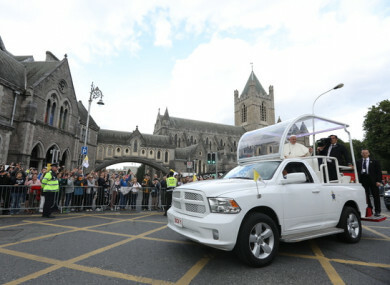 There were loud cheers along the route as the pontiff’s custom vehicle made its way from the Pro Cathedral via the top of O’Connell Street and up towards Dame Street, as he travelled to an engagement at the Capuchin Day Centre. In fact, there were even cheers for two bicycle-mounted gardaí who cycled the route about ten minutes before the pope, as the excited crowd lined the rows of steel railings. Many waved Vatican flags, which were being sold at makeshift stalls and by vendors making their way through the crowds. Groups of protesters, calling for justice for survivors of clerical abuse, dotted the route along the way. One man carrying a sign saying “arrest the pope” was greeted and congratulated by two passers-by as he stopped to speak to TheJournal.ie. Elsewhere along the route, people stopped and took pictures of a wax figure of Pope Francis mounted outside a window of the Wax Museum Plus, which overlooks O’Connell Bridge. From at least 9am this morning, tourists who had made the trip to Ireland for the papal visit gathered to secure a place along the route. By lunchtime, groups had begun to line the barriers at the best spots along O’Connell Bridge, College Green and other areas. Hours before the parade, many stood at Dublin Castle to catch a glimpse of the pope as he passed by at around midday – and were delighted when they did. Giuliano Badista, who lives in Dublin city centre and attended the parade with his family, was overwhelmed at having seen Pope Francis. “There’s no way to express how happy we are,” he said. I have been waiting for the moment since 2016. The Church is dying here in Ireland. He is going to bring a message of hope and make Ireland a Catholic country again. Gerard Cunningham travelled over from the United Kingdom for the papal visit. It will be a momentous occasion and the actual sense you will get of the universality of the [Catholic] Church with people from all over the world… it makes you feel proud to be part of it. Dublin City councillor Mannix Flynn, who is a survivor of abuse in an industrial school, was holding a small protest where crowds had gathered to see the pope arrive at Dublin Castle. He called for priests, and those involved in the cover-up of abuse, to be held to account. “The days of that dogma, the days of that fear of the Church, the fear of the horrendous consequences if you challenge these people, are gone. We’re not here to disrespect people. Most of my family are Catholics, they go to Mass, but we are in great distress, my community is in great distress, and my country is in great distress. The pope is welcome here – but he must be held to account. Earlier today the pope paid a courtesy visit to the Áras. He delivered an address to politicians, clergy and other invited guests inside Dublin Castle, where he told the audience he acknowledged the abuse suffered by people at the hands of the Catholic Church in Ireland, which he described as a “grave scandal”. Speaking afterwards, leading campaigner and abuse survivor Colm O’Gorman said the pope’s failure to apologise to victims was a shameful deflection of responsibility. Later in the afternoon hundreds of locals and tourists made their way to the Pro-Cathedral on Marlborough Street, close to O’Connell Street. The pope visited the church to greet married and soon-to-be married couples before beginning his parade. Tonight, the pope will address the Festival of Families event at Croke Park. The concert is being held as part of the Catholic Church’s World Meeting of Families, which has been taking place at the RDS in Dublin in recent days. Email “'That was a bit too fast': Popemobile travels through Dublin with unanticipated haste ”. Feedback on “'That was a bit too fast': Popemobile travels through Dublin with unanticipated haste ”.